The Caremax rollator will make getting around so much easier.This rollator comes equipped with hand brakes that help you ease to a complete stop as you walk. The locking mechanism keeps your rollator firmly in place when not in use. You can adjust the height of the handles to meet your personal needs. It rolls front swivel wheels for easy maneuvering and also looks great. This foldable rollator is the ideal space saver, too! The rollator features a comfortable seat and backrest. When you are done walking, you will feel relaxed after sitting down on the attached seat and leaning on the backrest. They are comfortably cushioned to your liking and provide great support when you are sitting. 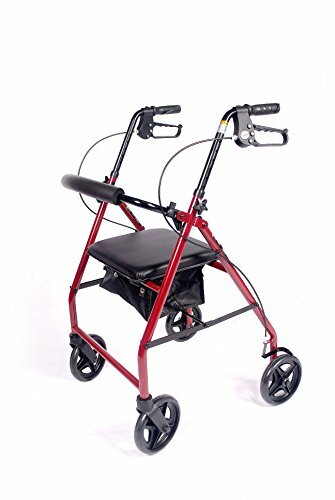 This rollator also features a convenient storage bag to keep all of your personal belongings.It is great for holding things such as your glasses, medicine and books. Enhance your mobility and the quality of life with a Caremax premium rollator. View More In Rolling Walkers. If you have any questions about this product by CareMax, contact us by completing and submitting the form below. If you are looking for a specif part number, please include it with your message.